The 1951 remake of Show Boat is one of my favorite movie musicals. It was directed by George Sidney, who also helmed such famous musicals as Annie Get Your Gun (1950), Kiss Me Kate (1953), and Bye Bye Birdie (1963) in addition to The Three Musketeers (1948) and Scaramouche (1953). 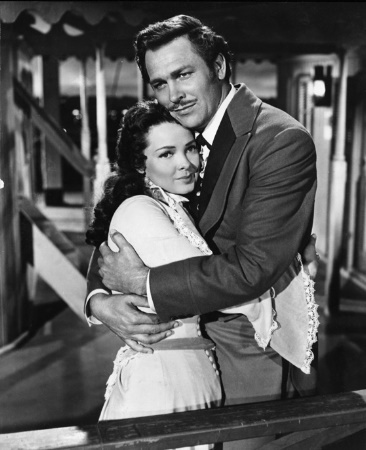 Howard Keel was the leading man in Show Boat, which co-starred the talented Kathryn Grayson. Keel was also in Annie Get Your Gun and starred with Kathryn Grayson again in two other musicals: Kiss Me Kate and Lovely to Look At (1952). The movie Show Boat is based on a book by Edna Ferber. Jerome Kern wrote the music and Oscar Hammerstein II wrote the script and song lyrics. It is one of MGM’s most popular musicals. There are quite a few differences between this remake and the 1936 original version. Many movie critics like the earlier one better, although the 1951 remake is more elaborate and the running time is shorter. I have never seen the 1936 version of Show Boat. Trouble begins when a man named Pete (Leif Erickson), who works on the show boat, finds out that Julie has given a necklace he gave her to a black woman. Julie tries to get away from him and her husband, Steve, hits him. Joe is mad at Julie and knows a secret about her that will cause her to be fired from the show. He goes to the local sheriff and tells him that Julie’s father was white and her mother was black. He adds that Julie is married to a white man. The sheriff goes to the “Cotton Blossom” and confronts Julie, Steve, and Mr. Hawks since interracial marriages are against the law. Mr. Hawks does not want to, but has to let Julie go. Steve leaves with her. Before Julie leaves, Magnolia gives her an early Christmas gift that she made herself. As Julie and Steve depart the show boat,” Joe (William Warfield), who works on the boat, sings the famous “Ol’ Man River” song as the fog rolls in off the river. They move into an expensive hotel in Chicago. At first, they are happy singing “You Are in Love” and “Why Do I Love You.” Ravenal gambles and makes a lot of money. He buys Magnolia jewels and spends his money lavishly. However, his luck begins to run out and he owes debts. Magnolia offers him her jewels to sell, saying she loves him and not the money. Her husband sells them and loses all the money. He leaves Magnolia without telling her, not realizing that his wife is pregnant. Magnolia is forced to find a job to support herself and her baby. Julie finds out about Magnolia hardships. Julie’s story is heart retching and the saddest part of the story. She does two courageous and compassionate things that change Magnolia’s life. I cannot tell you the rest of the story without spoiling it. The plot of Show Boat is not the usual happy, simple plot of most musicals. It is more like a drama with musical performances. The film’s background is quite interesting. Judy Garland was chosen to play Julie, but her contract with MGM has ended by the time the part was available. The next choices were Dinah Shore and Lena Horne, but they were dropped. Ava Gardner won the role and did an outstanding job. George Sidney was sick for several days and associate producer Roger Edens had to take over for him. He directed the scene with the fog when Julie and her husband left the show boat and William Warfield sang “Ol Man River.” Many critics say this was the best and most original scene in the movie. Roger Edens’ name is not listed in the credits. Edens searched for the singer to play Joe who sang “Ol Man River,” and he discovered the unknown William Warfield. The most famous line in the movie is Joe E. Brown’s Andy Hawks. who is drunk on New Year’s Eve. saying “Hap---py New Year!” Notice how Agnes Moorehead as Parthy uses it in the ending. 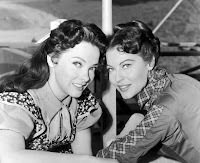 Leif Erickson’s name is misspelled in the credits as “Lief.” Ava Gardner’s Julie plays a big sister role to Kathryn Grayson’s Magnolia, but both actresses were born year in 1922. Both grew up in North Carolina towns too. Ava was born near Smithfield, NC and Kathryn Grayson in Winston-Salem, NC. When Kathryn Grayson died last March, the Ava Gardner Museum in Smithfield did a tribute to her. Howard Keel was known as a fine singer, but also played dramatic roles, such as Clayton Farlow on the Dallas television show from 1981-1991. The water used as the Mississippi River was the lake built for the Johnny Weissmuller Tarzan movies made at MGM Studios. It was on a back lot and was called The Lagoon. An amusement park bought the boat in 1973 for one of its attractions and it was taken apart in 1995. Show Boat boasts an engrossing story, a terrific cast, and marvelous music and songs. Try to see the new DVD, which features clear, beautiful color. Aki, very interesting review...especially the fun trivia like the fact that both Ava and Kathryn were Tarheels by birth! I also really like your point about SHOW BOAT being a "serious musical." The majority of musicals during the 1930s and 1940s were indeed lighthearted (with a few notable exceptions like the original SHOW BOAT). Do you think it was the influx of Broadway-originated movie musicals in the 1950s and 1960s that changed that? There are serious underlying themes in the film adaptations of Broadway classics such as THE KING AND I, WEST SIDE STORY, and THE SOUND OF MUSIC. Very thought-provoking post! Thanks for the shout out to the Ava Gardner Museum. Currently, we have a tribute up to Lena Horne, a good friend of Ava's who originally was offered the role of Julie until MGM stepped in. This is one of the more popular musicals I've never seen. My grandmother adored this film, so since I detested her I decided I would never watch it. It sounds very engaging, especially with the mature themes, so I might reconsider watching. Aki, I think that William Warfield's rendition of "Ol Man River" is one of the most outstanding songs ever sung in a musical. I really enjoyed your informative review. Even though I have never seen this film I have heard about it and certainly know about the classic "Ol Man River" song. Living near North Carolina I am aware of the Ava Gardner museum near Smithfield, though I have never seen it and have visited Winston-Salem many times. After reading this review it makes me want to see it. Very interesting write-up, Aki. 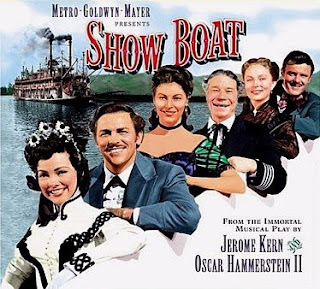 It has always fascinated me to see the evolution of Showboat from the time it was written to the 1951 version. The original stage play used what we understand now are very offensive racist terms and stereotypes. Then the 1936 version changed the terms to what is still offensive, but a little less so, although Paul Robeson's character still retained the stereotype. By 1951, the racist terms were gone, so far as I can remember. The original story was quite a bit darker as well, and by 1951 had become a little Hollywoodized (my made-up term) to remove a lot of that. Still, it's a powerful story, sad and yet uplifting. I remember hearing that Lena Horne was devastated at not getting the part of Julie, but I did see her in a sort of short subject version of a Showboat number playing Julie. I can't remember where or for whom that was made. Thanks for a thought-provoking and fun article. Aki, as usual your review of Showboat is so well researched and thorough! Nice job. This is one of my favorite musicals on film. I don't think the acting or the singing is so much better than any other, it's the minor characters. I mean, seriously, can you beat Joe E. Brown and Agnes Moorehead? They are a riot. And "Ol Man River"...can you say show stopper and clearer. Aki, very good post. I've seen the 1951 MGM"Remake" I like the 1936 Universal Black & White film with Irene Dunne and Paul Robeson directed by James Whale(Yes That James Whale) so much better, it's not yet on DVD, and is very seldom run . Rick, I think you are correct about the broadway musicals being more serious. Without a deeper plot than the lighthearted musicals, not many would go see them. There is a really nice website for the Ava Gardner museum in N.C. for those of you who are Ava fans. Jessica, thanks for your comment about the museum. Becky, I would love to have seen the 1936 version and to compare the two. Yes, the 1951 movie was toned down. Paul, I am envious that you have seen the first one. I couldn't find it anywhere and now know why. Anon, you are so right about Agnes and Joe. They are always a pleasure to watch on screen. Kim this is a good mature musical and one I think you would really like. As for "Ol Man River" now that's a classic. I thank all of you for your kind comments. Toto, I agree that the best song in the movie is definitely "Ol Man River." You are right. It is truly an outstanding song! Absolutely superb write-up, Aki! I've never seen this musical. I guess I need to see Howard Keel in more films because the only movie I can remember him in is THE DAY OF THE TRIFFIDS. Your lovely description of this film makes it sound very good. I'll check it out from Netflix. Thank you for sharing this musical with us! Nice write up...while you say you haven't seen the original 1936 version...I haven't seen the remake. Now I'll definitely have to check it out! I have to agree that Ol' Man River is the best song of the musical, but I do love Can't Help Lovin' Dat Man as well. Great post! One of the few really positive reviews of this film, and I am glad I stumbled across it online. I can say that I *have* seen the 1936 version, and while it is quite strong and marvelous, there is more than enough room for other versions, including this first and so far only attempt to film in color. People have attacked this one for so many strange reasons- accusing it of being overly pretty, not gritty enough, and the oddest claim that it's "politically correct." (I guess that's because in this version the words "ni--er" and "darkies" are not uttered, and Joe is not henpecked by his own wife, who calls him 'shiftless,' 'lazy,' and other insults from the earlier film. Go figure.) There's also complaints about it being too short. Everyone forgets that the original stage version clocks in at over 3.5 hours, and that much length would be almost impossible to transfer in a feature-length film- especially when modern audiences do not respond very well to musicals as it is. As it is, Keel, Grayson, Gardner, and William Warfield all deliver stunning musical performances. I found it very interesting too!